HOS 247 offers a unique ELD system to ensure that your driver is in compliance with FMCSA ruling. In addition, it delivers a superior safety and productivity for any size fleet. 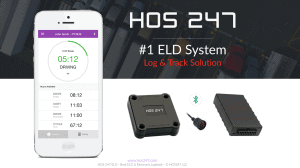 ELD HOS 247 review provides a complete system that includes a logbook app and standalone logging device. Those components together with the driver’s smart phone provide a robust system. This system is ideal for small to medium fleets as well as owner-operators. Automatic HOS– Automatic hours of service calculation and violation alerts. In addition, the driver could get an Automatic recording of driving time, miles and locations. DOT Inspection Mode– Simply show logs on your phone or tablet. Multiple HOS Rules– Compliant with multiple HOS rules including Property/Passenger 60-hour/7-day & 70-hour/8-day. Electronic DVIR – Vehicle inspection reports are created and submitted in seconds. Compliance Monitoring– Monitor your drivers’ hours of service logs and DVIRs. Receive alerts to prevent violations. Fleet Tracking- Track your vehicles in real time and view their location history. IFTA reporting– Automatic IFTA state mileage reporting saves you time and money. recording driving hours and miles automatically. Logbook App - Easy to use app for managing hours of service logs. It connects to ELD via bluetooth and displays recorded driving time to a driver. and smartphones. Use your own or purchase devices and data plans from the company. end to the ELD device. The dual fastener is provided for dash mounting. 2. Install ELD- Log in to HOS 247 Logbook App on your tablet/smartphone with a username and password created during a sign up process or provided by a fleet manager. connect to ELD via Bluetooth. Green Bluetooth indicator at the top right corner means you are ready to start using ELD. to see log details. Click “More” to view historical logs. violations and mitigate compliance risks.